A very Happy New Year to everyone! It is always nice to start fresh after a busy holiday season! 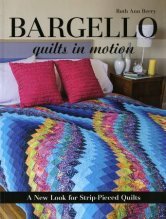 I look forward to January because I think life should slow down and I will be able to enjoy a nice long quiet month to contemplate new ideas for quilts I see on Pinterest. However, it actually means that I should be catching up on the 2015 (and beyond) projects I never finished, but so far neither has happened yet! Really January, slow down!! So weather you are planning new projects or finishing up old ones I hope your 2016 cooperates for you and this is your best productive year yet! I always have hope for me! Introducing an innovative new product! Wait until you get your hands on this rugged paper that looks, feels, and wears like leather, but sews, cuts, and washes just like fabric. kraft·tex™ is supple, yet strong enough to use for projects that get tough wear. 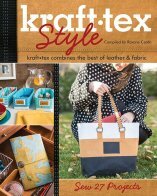 Use it to bring an exciting new texture to your craft-sewing projects, mixed-media arts, and bookmaking. We are starting a new block of the month! 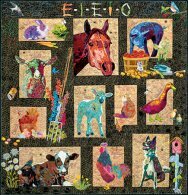 This adorable quilt uses non-traditional fabrics to applique' the farm animals. Finished size is 82"x86". Toni will be on hand to teach this new applique' technique! The first class is gathering fabrics and supplies. 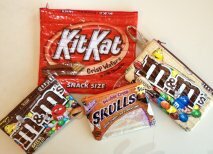 These zipper pouches are made with real candy bags! like Op-art paintings. The biggest surprise is how simple these quilts are to make! Join Toni from start to finish starting in February. A perfect stash busting quilt! 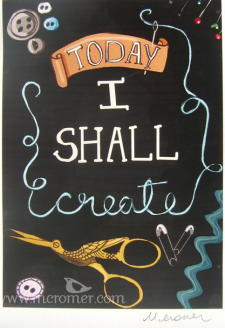 Anyone who has an interest in hand stitching is invited to join us for a girls day out! We are continuing with our "Santa's Village" blocks. Bring any project that Toni has taught and she will guide you through finishing it up! Haven't taken a class from Toni yet...not a problem! She will help you get started with her innovative method of foundation piecing.